Dive Oahu Hawaii Guide - A vacation in Oahu can never be complete without taking a plunge into the inviting blue waters of the Pacific. And what better way to explore the secrets of the seas than by going on a dive Oahu trip. 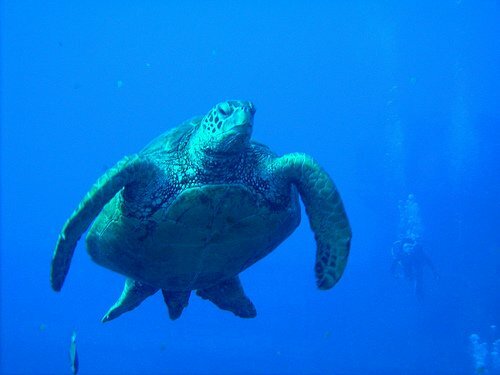 Oahu has a large number of beaches where different diving opportunities are available. These dive sites present a range of choices in terms of natural and artificial treasures. You can go diving for plane and shipwrecks, see offshore lava formations, or catch a glimpse of rare marine life. This Hawaiian island is famous the world over for its scuba diving spots. There are dozens of populated as well as deserted beaches where you can go scuba diving. And it does not matter whether you are a trained professional or an inexperienced first-timer. Oahu has something for everyone. The Three Tables, Sharks Cove, Devils Rock, Ka'ena Point, and Turtle Heaven on the North Shore, all have depths in the range of 50 to 100 feet and offer ideal scuba diving opportunities. These diving sites are accessible mostly from the shore itself, while in some cases you may have to be taken there in a boat. On the West Shore, you have the Makaha Caverns, Mahi Shipwreck, Electric Beach, and Tech Reef that are very popular with scuba divers. The Electric Beach is a particularly good place for viewing sea life. A wide variety of eels make their homes in the coral bed of the sea. The Kewalo Pipe, Fantasy Reef, and Rainbow Reef and Magic Island on the South Shore also have a vibrant marine life with different types of spotted puffer fish, turtles, Moorish idols, morays, porcupine fish, fantail filefish, barracudas, and triggerfish. If you are lucky, you might even get to see the elusive manta ray. And to spot humpback whales, take a trip to the Blow Hole. The best time to see these majestic creatures is during winter and early spring months. Another popular diving site is the Manana "Rabbit" Island. Located on the East Shore, this site boasts of excellent coral formations and plenty of lobsters. You also get to see triton trumpets, helmet shells, tiger sharks, and white tip reef sharks here. Having said all this, the best place to see marine life in all its glory is the Hanauma Bay. This is actually a nature preserve on the South Shore and the waters here are home to more than 100 species of fish. If you are an amateur, you can stay close to the sand patch inside the barrier, whereas if you are carrying proof of certification you will be allowed to venture into greater depths. This is one place which abounds in large resident eels, octopuses, spotted eagle rays, jack fish, and green sea turtles. The waters around Oahu have witnessed a number of plane crashes and shipwrecks. These sites are now extremely popular with adventure sports enthusiasts. The Corsair Wreck on the East Shore is one of the most regularly visited wreck spots. 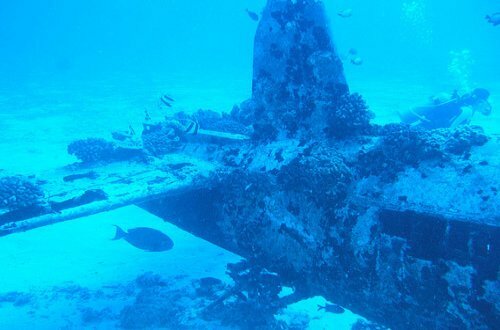 Situated at a depth of 110 feet, it features the ruins of a World War II era plane. Around the wreck are a number of underwater caves and ledges that can be explored. There is also a good chance that you might come upon a sleeping white tip reef shark. Along the China Wall you can spot various species of eels, eagle rays, as well as turtles. The Baby Barge's beautiful coral encrusted deck which rests at a depth of about 45 feet is worth diving for. The caves around the ledge are a favorite resting spot for green sea turtles and white tip reef sharks. You also have the greatest chance of spotting the Galapagos sharks at this site. Corsair wreck. Sits in approx 30M water. Sank/ditched in 1948. Pilot survived the water landing. The most popular dive on the West Shore is the Mahi Wreck. The Mahi was sunk in 1986 and now stands upright at a depth of 90 feet. White-spotted eagle rays can often be seen around this wreck. Sea Tiger Wreck and Turtle Canyons, situated just off the shore of Waikiki, are home to a staggering variety of fish and other sea creatures. You can also get a clear look at the large coral heads here. Among the well known Oahu dives is the YO-257 Wreck site. Resting upright at 95 feet, this Navy yard oiler makes for an impressive sight. You can swim the stern and get a close look at the blue coral hanging from the walls and ceilings on the inside of the ship. If you have always been fascinated by these magnificent creatures of the sea, you should not miss the opportunity of going diving with the sharks while in Oahu. The ocean around the island is frequented by various different types of sharks, especially the white tip reef sharks, tiger sharks, scalloped hammerhead sharks, sandbar sharks, and even the whale sharks. And the best part is, in some areas the visibility exceeds 200 feet which makes it ideal for watching these gorgeous creatures in their natural habitat. 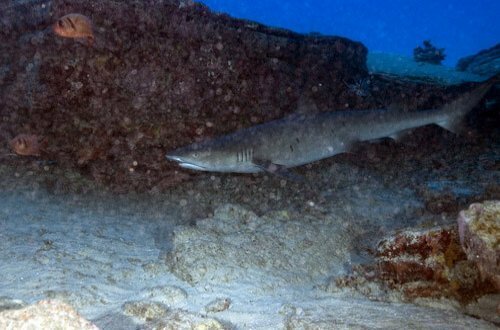 Plenty of shark diving tours are available in Oahu, and choose any one of these to embark on a thrilling adventure you are not likely to forget in a long time. Most of the wildlife tours of this kind take place on the North Shore. You will be taken about 3 miles into the sea on a boat, and on the way you are likely to see dolphins, green sea turtles, and even humpback whales, depending on the season of your visit. Once in the shark infested waters, you can choose to go deeper in a special shark cage or just stay on board and watch as these elegant creatures circle the boat. If you do go down in the cage, you can get a much closer look at the sharks, and might even end up brushing your hand against one. The sharks most commonly seen are the sandbar sharks, Galapagos sharks, gray reef sharks, and the hammerheads. Share Your Scuba Dive Oahu Hawaii or Hawaii Vacation: We're looking for stories, tips and experiences from any Oahu vacation you've been on. Why not take a few moments and Share it with everyone! We Hope You Find This Dive Oahu Hawaii Information Guide Helpful, Have A Save & Romantic Getaway in Oahu Hawaii!! !